One of the most important things to do for your body is to stay hydrated – especially during hot summer days, spent in the sun. Infusing your water with different fruits, vegetables, and herbs is an elevated way to stay hydrated. It’s simple to do, and will have you feeling like you’re lounging at a spa. It’s unexpected and just so refreshing. Who could say no to a cool glass of water with a twist? 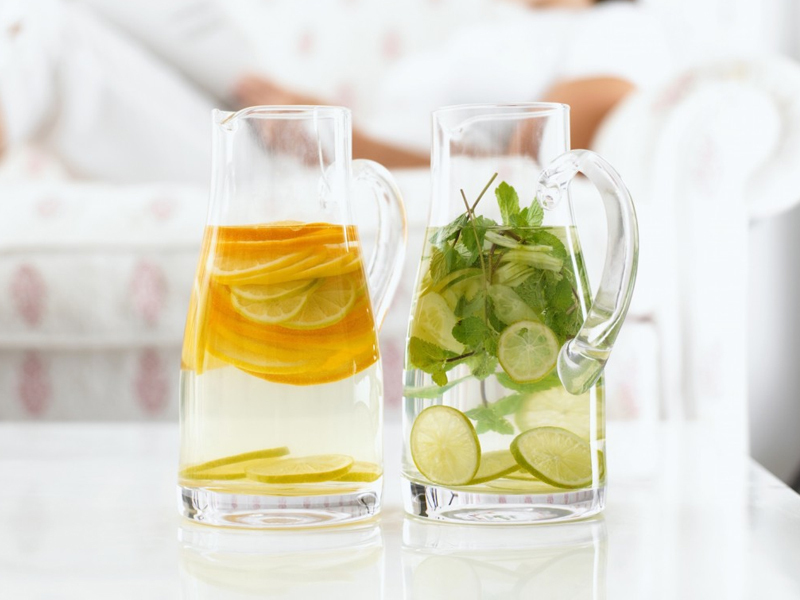 Here are three of our favourite infused spring water recipes. Watermelon is a classic summer fruit favourite and it’s light and sweet juice is tasty, even just by itself. However, combine it with some coriander and you’ve got the most refreshing drink going around. Fill a glass jar or jug up halfway with cut up watermelon. Add a few leaves of coriander (split in half for maximum flavour) and fill to the top with chilled spring water. Put a lid on and store in the refrigerator for 2-4 hours before drinking. Aside from tasting delicious, my favourite part about this drink is the way it looks. The blackberries sit at the bottom and the mint leaves at the top, creating an ombre effect in between. In a bowl, squash (but don’t destroy) a handful of blackberries, then add them to a glass jar. Top with a few leaves of mint (split in half for maximum flavour), and fill to the brim with cold spring water. Put a lid on the jar and store in the refrigerator for 2-4 hours before drinking. These three greens come together in perfect harmony in this crisp, thirst quenching summer beverage. Add a few slices of cucumber (peeled, if you so desire) to a glass jar and top with a few leaves of fresh coriander (split in half for maximum flavour) and a tiny bit of fresh dill. Dill is very flavourful, so start with a very small amount and add more if necessary. Put a lid on the jar and store in the refrigerator for 2-4 hours before drinking. The perfect addition to complete these infused delights is some Aussie Natural spring water! Have instantly cold water all summer long with one of our water coolers from just $9/ month! Contact Aussie today for free state wide delivery!